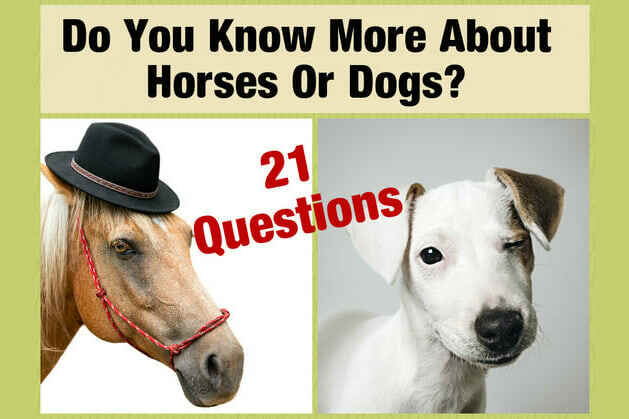 Do You Know More About Horses Or Dogs? Which of the following is NOT a dog breed? An adult horse’s brain weights about half that of a human. Horses have bigger eyes than any other land mammal. Dogs are America's most popular pets. Dogs hear better than humans. Horses teeth never stop growing. A dog's brain is about half the size of a human brain. How soon after birth can a foal (newborn horse) canter? Which of the following is not a horse breed? A horse’s teeth CANNOT be used to estimate its age. Dark chocolate is toxic to dogs. On average, how many hours a day do horses sleep? And finally, a dog's heart beats slower than the average human heart. You are totally a DOG person! You are totally a dog person. You love to listen, you always keep things lively, and you are most likely dominant. You are sociable and intelligent, and you tend to tolerate other animals. Are we spot-on? Let us know in a comment below, and share the quiz with your friends to find out what they really are! You know equally about horses and dogs. You exist in the fascinating 50-50 zone. Your general knowledge about dogs and horses indicates that you are in fact both clever and naive, extroverted and introverted, AND traditional and rebellious. You combine humility with self-confidence, and you daydream a lot. Are we spot-on? Let us know in a comment below, and share the quiz with your friends to find out what they really are! You are totally a HORSE person! You are totally a horse person. You have a passion for life! You are grounded, conscientious, and idealistic. You make a great first impression, and live in harmony with the world. Did we get it right? Let us know in a comment below, and share the quiz with your friends to find out what they really are! Only 3% of the population know more about horses. Leave us a comment below with your result.